2019 is shaping up to be an exciting year on the Rally WA Calendar. There is a five round entry level gravel rally sprint series as well as the full WA state rally championship (WARC). The Zestino Rally Sprint series is all contained within private property at our venue in Dowerin. Roads making up to 10 kilometer stages are used in different configurations throughout the year. Competitive distances can be up to 40km per event. There are three daylight and two twilight events in the calendar. The WA state championship is hosted in different locations during 2019. Most events are based in state forest or tree plantations nearby to country towns. Unlike the last few years the Forest Rally will be the first cab off the rank. There could also be some major changes from previous years. It seems the service park may need to relocate from its long time home in the Nannup townsite. Some of the rally’s gravel stages are also being revised. The Busselton super special stage should stay as is on the seaside town foreshore. In 2018 the Karri rally was round 1 in March. The very dry weather made the roads loose and dusty. In the Rally WA 2019 calendar the event will be the second WARC rally. It is hoped the later date will add some moisture to the Manjimup roads therefore providing better compaction and less dust. Besides the date change the rally is looking for a new service park as the old mill town of Nyamup is no longer available. The Safari and Kirup rallies will remain in the status quo. The former running in Boddington using private land on the June long weekend. The latter will again use stages in Balingup with the service park in Kirup. 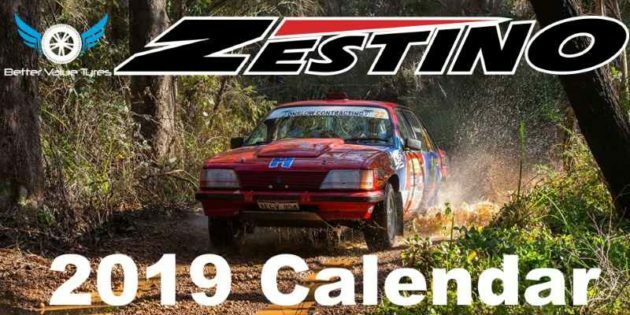 The Darling 200 rally is undergoing major changes in Rally WA 2019 calendar. Coming online as a full WARC event (instead of Clubman Cup only) it will run in September. The move from November should reduce dust and give better traction on the loose Jarrahdale roads. The event will effectively be a “ground up rebuild” however will still use road book instead of pace notes. The final WARC event is the Experts Cup in October which has jumped later on the Rally WA calendar in two successive years. Originally a winter event the rally caused damage to some logging roads. Seems like the wet and the mud was making it difficult to regrade and logging trucks were getting stuck.The move to a later date should therefore keep roads drier and make it easier and less expensive for any post event repairs. With five rounds in the Zestino Rally Sprint Series and six in the WARC, there’s plenty of gravel action for everyone in the Rally WA 2019 calendar. More than likely there will be some cross over of competitors between the two competitions during the season. In previous years several competitors have started out with the sprints and have moved up to full championship level rallying. Vice versa several rally competitors have taken advantage of the sprints to test, tune and keep skills sharp between the WARC events. Better Value Tyres is a great supporter of local motorsport in WA. They are the WA retailer for Zestino competition tyres.